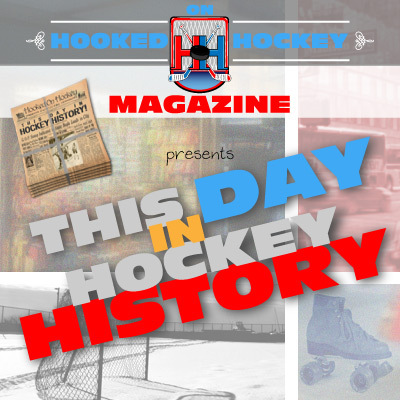 Today in hockey history, a man that had a 47-year career in the NHL is born, the Hall of Fame inducts a new class, and a country that hosted an overseas NHL game proves to be good luck for one of the participants. September 13, 1926 – Emile “The Cat” Francis was born in North Battleford, Saskatchewan (no relation to Julie the Cat). He played as a goaltender with the Black Hawks, Rangers, and several WHL and AHL teams from 1946-1960. He head-coached the Guelph Royals (OHA) from 1960-62, the Rangers from 1966-75 (plus one year as assistant coach from 1962-63), and the Blues from 1976-77 and 1981-83. He was also the GM and executive VP of St. Louis from 1976-1983. He joined the Whalers as president and GM, finally retiring in 1993. In 1982, he was both named the recipient of the Lester Patrick Award (contributions to the game) and elected to the Hall of Fame as a builder. He’s also credited with being the first goaltender to use a first baseman-like glove (baseball) rather than the standard padded gloves skaters used. September 13, 1978 – The Hockey Hall of Fame inducted its latest members: Jacques Plante, Marcel Pronovost, and Andy Bathgate; and builders Sam Pollock, J.P. Bickell, and William Thayer Tutt. September 13, 1992 – The Blackhawks won the second of two preseason exhibition games 5-4 in a shootout played at Wembly Arena in London England. Yes, apparently they went to the shootout before it was standard practice circa 2005. The Habs won the game played the previous night (3-2), and, just like the Rangers in the 1993-94 season, England proved to be good luck as Montreal would win the Cup that year (the Rangers played the Leafs twice in the same arena in 1993 and won in 1994). I’m surprised more teams lobby to start their season in the UK.